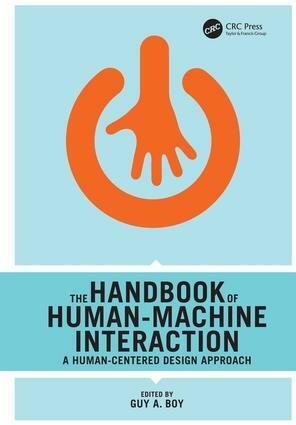 The Handbook of Human-Machine Interaction features 20 original chapters and a conclusion focusing on human-machine interaction (HMI) from analysis, design and evaluation perspectives. It offers a comprehensive range of principles, methods, techniques and tools to provide the reader with a clear knowledge of the current academic and industry practice and debate that define the field. The text considers physical, cognitive, social and emotional aspects and is illustrated by key application domains such as aerospace, automotive, medicine and defence. Above all, this volume is designed as a research guide that will both inform readers on the basics of human-machine interaction from academic and industrial perspectives and also provide a view ahead at the means through which human-centered designers, including engineers and human factors specialists, will attempt to design and develop human-machine systems. Guy A. Boy is University Professor and Director of the Human-Centered Design Institute (HCDi) at the Florida Institute of Technology, Senior Research Scientist at the Florida Institute for Human and Machine Cognition, and Chief Scientist for Human-Centered Design at NASA Kennedy Space Center. Until 2008 he was President of EURISCO International (European Institute of Cognitive Sciences and Engineering) and had managed the organization since its creation in 1992. An engineer and psychologist, he received his Doctorate in 1980 from the Ecole Nationale Supérieure de l'Aéronautique et de l'Espace (SUPAERO: French Aerospace Institute of Technology), his Professorship Habilitation (HDR) from Pierre and Marie Curie's University (Paris VI), and his Full Professorship Qualifications in Computer Science and Psychology. He introduced and taught cognitive engineering at SUPAERO. A researcher at l'ONERA (The French Aerospace Lab) from 1977 to 1988, Boy was seconded at NASA-Ames Research Center from 1984 to 1986 in the Aerospace Human Factors Research Division. He then joined NASA as the Leader of the Advanced Interaction Media Group from 1989 to 1991. His research focused on safety-critical systems, human-centered design and automation, cognitive engineering and ergonomics, electronic documentation and aerospace systems. He developed various methods and techniques that include the Group Elicitation Method (GEM), Cognitive Function Analysis (CFA), and the Active Design Documents (ADDs). Guy Boy is the author of three major books and more than 200 scientific and technical papers. He is an expert in Information Society and Technology for the European Commission and an expert for the European Space Agency (ESA) for the definition of the overall human-machine interaction and artificial intelligence research program in 1991. He was a legal expert for aircraft accident investigations from 1992 to 1994. From 1995 to 1999, Boy was the Executive Vice-Chair ACM-SIGCHI (Association for Computing Machinery-Special Interest Group on Computer-Human Interaction). From 2002 to 2005, he was a member of the Board of Directors of the French National Center for Technological Research in Aerospace (CNRT-AE). He is a Permanent Member of the Academy of Air and Space; the Vice-President and co-founder of the Cognitique Institute (IdC: a major Engineering training program in France, teaching cognitive engineering, and created in 2004) where he holds the position of Visiting Professor. Boy is the Chair of the Technical Committee on AeroSpace Human Factors and Ergonomics (TCASHFE) of the International Ergonomics Association (IEA). He was was the coordinator of the RoHMI (Robust Human-Machine Interaction) Network of Excellence (DG XII, European Commission) from 1994 to 1996 and the scientific coordinator of WISE (Web-enabled Information System for Engineering) project (IST) from 2001 to 2004. He has been the coordinator of the PAUSA (Authority distribution in air traffic management) project (French government, Ministry of transportation) since 2006.